This version of our award winning app was created for organizational use only and not for the general public. If you’re an individual that would like to purchase a single copy, please search for Essential Anatomy 3, which is also available in the Google Play Store.The best selling human anatomy app ever is now available on Android.To try out the technology please try out the free version for Essential Skeleton: Essential Skeleton which is also on Google Play***** Number 1 Medical mobile app in over 95 countries worldwide ***** Groundbreaking 3D Technology - No competitor competes with graphics and medical accuracy ***** Tuaw: "Make no mistake about it: Essential Anatomy by 3D4Medical is the future of touch-based anatomy learning. "Essential Anatomy is an app every doctor, physiotherapist, OT, nurse and medical student should own." ***** Award Wining App - Hundreds of features that make learning and referencing easyVisit our www.3d4medical.com website and watch a video that highlights the functionality and quality of Essential Anatomy as well as our "Coming Soon" section that highlights new features currently in development. You'll understand why it is the world's Number 1 Medical App! 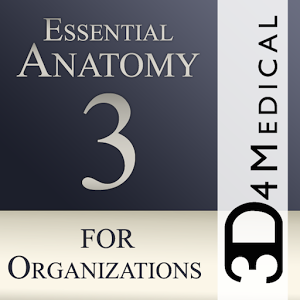 Here is the link: http://applications.3d4medical.com/help_essential_anatomy_android or press the link to our website ESSENTIAL ANATOMY 3 Essential Anatomy 3 represents the latest in groundbreaking 3D technology and innovative design. A cutting edge 3D graphics engine, custom built by 3D4Medical from the ground up, powers a highly-detailed anatomical model and delivers outstanding quality graphics that no other competitor can achieve. The app represents a unique approach to learning general anatomy. The graphics are unparalleled and make learning, through the use of informative content and innovative features, a rich and engaging experience. This app includes essential anatomy for 10 systems: ⁃Skeletal ⁃Muscles ⁃Connective Tissue ⁃Veins ⁃Arteries ⁃Nerves ⁃Respiratory ⁃Digestive ⁃Urinary ⁃Lymphatic ⁃also includes the Brain and Heart NEW 3D TECHNOLOGY Essential Anatomy 3 is responsive, visually stunning and effortless. The app is fully 3D, meaning that you can view any anatomic structure in isolation, as well as from any angle. EFFORTLESS NAVIGATION & FUNCTIONALITY Clever functionality found within the app allows the user to strip away layers of muscle via the ‘scalpel’ tool. This app provides users with the ability to turn on/off systems without the need to deselect individual structures or muddle through a multitude of predefined regional tabs, like other apps. PREMIUM INTERFACE DESIGN Essential Anatomy 3 is designed with the user in mind - the body itself becomes the interface. Unlike other 3D apps, which rely on predefined anatomic arrangements and regional dissections to guide the user, 3D4Medical’s Essential Anatomy 3 lets you find what you are looking for without complication. ---- New 3D technology via 3D4Medical's latest graphics engine ---- Over 4,000 highly detailed anatomical structures ---- Multiple Selection Mode - Hide/Fade/Isolate individual or multiple structures ---- Preset and customizable Bookmarks ---- Correct audio pronunciation for every structure ---- Latin nomenclature for each anatomical structure ---- User friendly and intuitive interface ---- Multiple search options ---- Dynamic quiz function - Drag and Drop and Multi-choice ---- Custom search modes ---- Extensive social media tools and sharing capability Please find our End User License Agreement here: http://applications.3d4medical.com/eulaAny feedback? We thrive on engaging with customers and, unfortunately, can’t respond directly to reviews. Contact our customer support at info@3d4medical.com. You will receive a response promptly!